Kris Neiman, Head of Administrative Services, at Kenosha Public Library shared news about a teen program that was very successful. I liked it because it was very simple and the results were phenomenal. 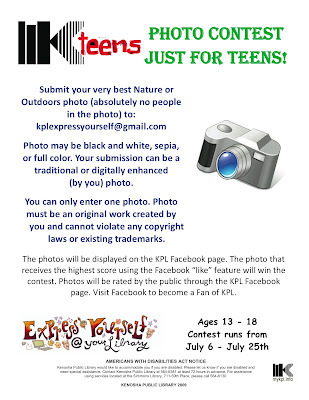 They invited teens to submit their photos to a gmail account (since the size capacity is greater and didn't overload their server) then had people vote on Facebook by using the "like" feature. Thirty five teens submitted pictures but the real success was the increase of Facebook fans from 86 to to 400 in TWO weeks. They are going to follow up with an adult contest in the Spring. As our customers' communication channels evolve it is important for libraries to keep up and FB Pages is an excellent communication tool. Way back when, FB had introduced their "Causes" pages but they really didn't work for a multitude of reason. FB Pages is the new generation. When people agree to be your fan, it gives you access to communicate news about your library directly to their news feeds in real time. Not only can you post updates, you can invites fans to your events, encourage them to interact with you and have fun with polls and other apps. It's free, popular and effective. In the PR world, we call that a no brainer :-) . Below is a list of strategies FB suggested to attract fans. Read the entire,10 Facebook Page Strategies Every Brand Should Know. I like the idea of using the "Like" feature as a voting tool! Clever use of social media marketing - it actually gives people a reason to Friend you or join the group! Wow! I also like the idea because it is more pro-active than simply "having a Facebook". Thanks for sharing! I'd like to know how many of those new teen fans stay active. Personally, when I become a fan of an org, if it posts things that I don't care about too often (for me, every day or two), then I just "Hide" the org so I don't see the posts anymore. So the question is, for those who joined just to vote on friends' photos, will the content that the library posts keep them interested or turn them off?? Hi Kathy - our FB page is pretty quiet. We do have interactions between our fans, but I think most people use the FB page as a information tool, not a social interaction page like a traditional profile page. Don't forget this fan base also included parents and friends of parents as well. 29% of fans are between 13-17, 21% are 18-24 and the third largest group is age 35-44 (18%). Now - how many of them turned our updates "off" is unknown, but we're at 610 fans and growing. I try to limit my updates so not to annoy the masses.